May Allah bless Sayyidina Umar! The sequence of topics and their treatment is charmingly idiosyncratic, with surprising points of reference, and unique metaphors and similes piled high: the Shariah functioning as a great shoal of fish for us minnows; the Sunnah as a trellis and Man as a climbing shrub. It builds to great effect, and at the end I marvelled at this wonderful man who found his home in Islam. 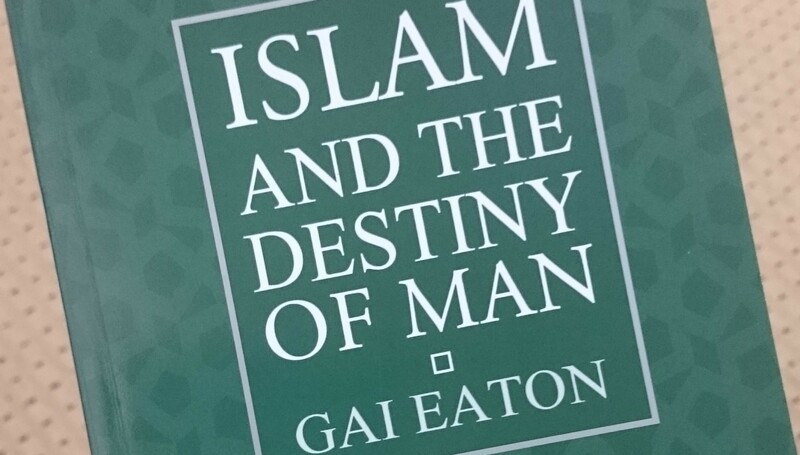 Islam and the Destiny of Man is a classic, and was a rare and important book when it was published in 1985. Well into the 90’s, introductory books in English for the new or prospective Western muslim were often limited to titles like “Vhat Islam Is?”, published in Lahore with the best of intentions. Reading the book today it is easier to pick out flaws. In particular, the author asserts a binary of a traditional existence that was harmonious and God-centered as opposed to the present corrupted secular modernity commencing somewhere around the Enlightenment (see King of the Castle for a lot more of this). That commitment sometimes manifests as a kind of reverse orientalism, conjuring a static, unchanging golden Islamic past that then must be defended with strenuous apologetics; and sees nothing of value in the constant godless upheavals of the present, as in the image of young Muslims being corrupted by Western higher education (“passport Muslims”, he sighs). I’m sympathetic to and see a lot of religious support for the idea of human spiritual decline from the point of Revelation to the End of Time, but the line graph of that would be a pretty messy seven-dimensional spiral chute and not a simple linear function from the Good Ole Days Plateau to the Trench of the Horrid Present. Strategies for adapting as a muslim to the challenges of the modern or post-modern age are needed much more right now than harkening back to the way things were before humanity left the farm, moved to the city and went to colllege. Written 35 years after the author embraced Islam, the book is in some part a record of a convert situating himself within the faith. The dialog with Christianity throughout the book is fascinating, and I got a strong sense of how his Christian origins have lingered with him, if only as doubts to have overcome or questions to have answered. The thorough grounding in Christian theology and the tenderness and grace in highlighting similarities and differences between the faiths are great strengths of the book. The sensitivity and respect he shows the Christian outlook is a great example to other converts in how to come to grips with their origins. Who we were is part of who we are, and being comfortable in yourself means coming to terms with that. Only with our muslim children will that background attenuate or transform or dissappear, and for that reason I am so curious to hear and read the voices of the children of our celebrated convert scholars, convert imams and convert da’ees, may I live long enough to do so. Islam and the Destiny of Man is available for borrowing at the Islamic Information Centre lending library in Kuching. Contact Ms Dayang Dahlia at 082-418562 for details.